This post has been sponsored by Bebe & Bella on behalf of the PRIMP Network. All thoughts/opinions are solely based on my experience. The only thing better than trying new skincare lines is trying a new skincare line at the start of a new season! I'm completely obsessed with trying new things and I'm always looking for the best products to share that are worth the time/money and ones that I truly love. The fall in New York has started out pretty chilly - I'm talking low 40's at night and frost advisories! It's kind of hard to believe since just a few weeks ago, it was still reaching 86 each day. With the quick temperature change, my skin hasn't really been adjusting well... It's been red and dry and I've been needing something that works more efficiently for this kind of weather change than my normal favorites. I've take probiotics before but I've never taken them as a part of a skincare routine. I was so excited to try these BeBe and Bella products, and after about 2 weeks of trying these out - I'm so excited to share how it's going! 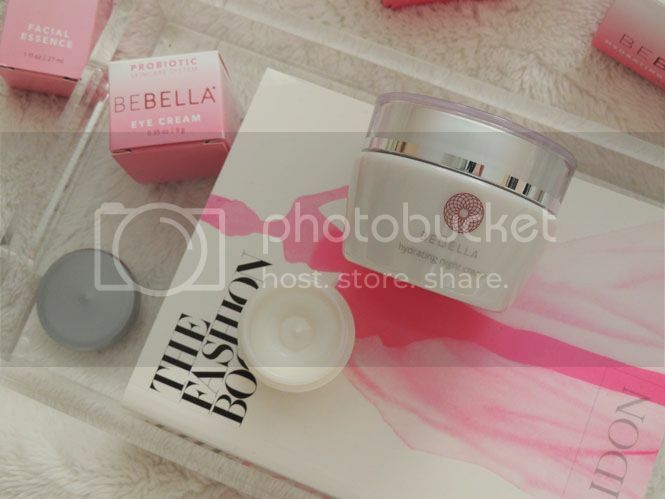 The BeBella line is the newest from BeBe & Bella and it's a dual probiotic skincare system. How cool?! My skin needs all the extra hydration and smoothness it can get, so I was so excited to begin this regimen. The BeBella system has a lot of steps and two routines - one for the morning and one for at night. The products work best when using them all together, so if you're going to try the line, make sure you grab all of the required steps! The brand prides themselves on product layering; so you begin with a cleanser and toner, then the essence, moisturizer and eye cream(s). If I had to name only one thing I LOVE about the BeBella system, it's hands down that the products are ALL water based instead of oil based. This is exactly what I've always needed - I've always had pretty clear skin (thankfully) but if I had to categorize it, it's definitely a combo of dry and oily in my T-zone. Oil-based products never work well with my skin and always make me break out, so I was so happy when I saw that these were all water based! I love that you can easily try the products in sample sizes first. It's also great to have if you're already using the products, and are takinga trip - I went away for two nights last weekend and took my samples with me; I didn't have to worry about the full size bottles weighing down my bag. Following this routine, I started to see results after my first week of using the system daily. Now, 2 1/2 weeks in, I can tell that my skin is smoother and becoming more even and hydrated. I can even tell by how long my face makeup lasts in a day! Like I mentioned, I've never taken supplements as a part of a skincare routine. I think it's genius though - probiotics can only do good! These supplements help to rejuvenate and revitalize your skin from the inside out and I think pairing these with the skincare products is one of the main reasons that the entire line works so well! They're said to help create a protective skin shield and I most definitely see that already - 2 weeks in! 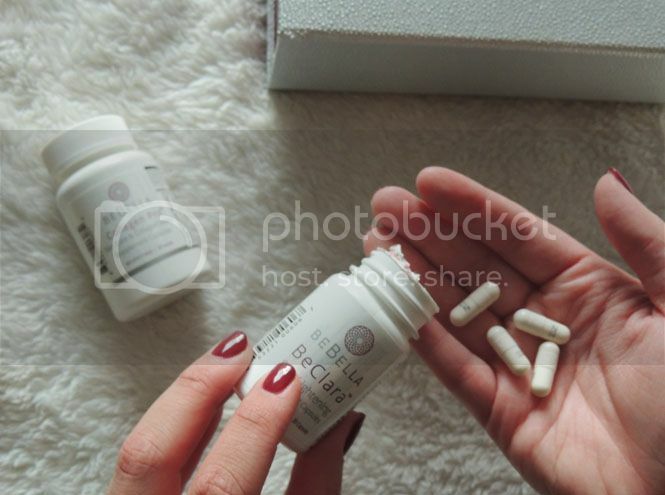 The BeClara supplement is a probiotic, skin lightener supplement. It has collagen in it and helps to improve your skins texture, it's hydration and has so many healthy benefits. I can't wait to see how even my complexion becomes with this! My skin definitely is not 100% even, so I'm excited to see how this helps that. BeBella's Collagen Pro is a nutritional supplement that gives your skin added nourishment that let's be honest - we ALL could use! I've been taking 1 per day since I recently started, but I think I'm going to start taking 2 per day (you can take up to 3!). I love that it naturally helps your skins moisture and dryness because that's what I struggle with most. I could go on and on about this cleanser all. day. long. It's SO good! It's meant to remove any leftover dirt/impurities and my skin feels so good after using it. It's thick but not heavy going on which is my favorite part! Some cleansers I've tried have made my face feel super dry after using it - and this is exactly why I LOVE this line of products - this cleanser gives the feeling of an awesome moisturizer! It's most definitely worth the price; a little goes a long way with each use and I don't think I ever knew such an awesome cleanser existed. As if it wasn't awesome enough - it even removes eye makeup! I'm obsessed with this stuff and I feel so much better after using it each time. Using this toner is the next step after cleansing and the first thing I noticed after using it was how well it reduced any visible pores. It's meant to balance your skin remove any left over residue; having two dirt-removing products in a skincare routine leaves you with THE softest skin, ever. I put a little bit of this toner on a cotton pad (does anyone else call them Swispers? Haha) and dab it all over my face and oh god does my skin feel fresh after using it! It may seem like an unnecessary step but I promise it's SO worth it! What a seriously amazing moisturizer/serum! It's super creamy and refreshing on your skin and it's meant to give your skin the highest percentage of natural and active ingredients. I LOVE how light this serum is and as part of the renewing process, it's an amazingly renewing feeling. Putting this cream on at night is something I look forward to literally all day! Is that so bad?! Haha! Every morning after using this at night, my skin glows and still feels so clear after as few or as many hours of sleep. It's meant to help lock in the moisture of your skin and it most definitely does just that! I like to think of it as my skin's recovery time - not only by getting sleep but by aiding my skin too. 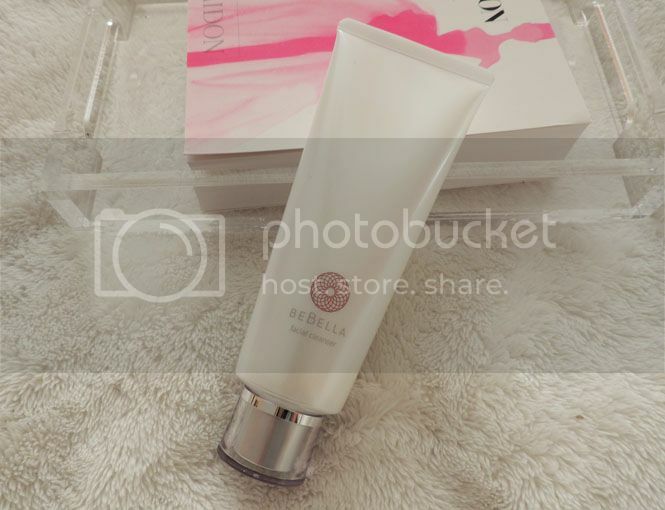 This is another BeBella product where a little bit goes a long way which is great since it's long lasting! This time of year especially is when I need lots of moisture and I can't wait to see how well it works when it gets really cold out (I'm a little dramatic - it's only reaching the low 50's most nights here but it feels really chilly!) so I'll definitely keep you guys updated on that! Keeping your eyes and the skin around your eyes healthy and safe is SO important. I've always taken really good care of my eyes - I think that comes from wearing glasses since 3rd grade and contacts since 5th grade - and this eye cream is the first I've ever used! I can't believe I hadn't tried one sooner, but I'm so glad I did. 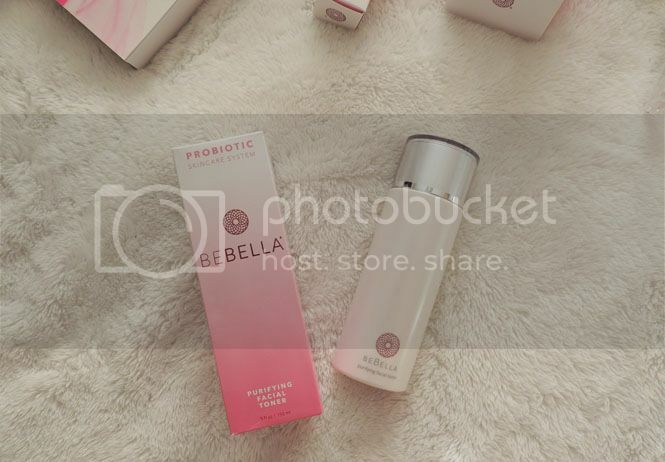 It has BeBella's probiotic filtrates mixed with Vitamin E and it feels SO good on your eyes. As a blogger/graphic designer/marketing strategist, my eyes are on the computer and my phone a LOT. You guys know how that goes - so by the end of the day my eyes are killing me and treating them with this soothing eye cream is so enjoyable and pleasant. An added bonus is that it helps reduce any fine lines surrounding your eyes - SO helpful. The skin under your eyes is so delicate and important to take care of and the way your eyes appear daily makes a huge impression on your overall appearance too, agreed? I feel like I'm putting little drops of gold on my eyes when I use this cream! I've noticed it helps reduce puffy eyes too which I struggle a LOT with! You need this in your life - it's the best little pot of gold I own. My favorite little beauty item. EVER. It comes every where with me, and it's the perfect size so that I literally can take it in any bag and any place I go! I use this both as a part of my morning/night BeBella routine and on-the-go, before and after my makeup is on. My favorite time to use it though is throughout the day sort of as a makeup refresher. It's like a little stick of joy performing skin miracles! It absorbs upon applying so you don't have to worry about ruining your makeup and it doesn't leave you looking shiny or oily which is huge for me. Major tip: make sure to take this little stick of heaven with you for your next plane trip! It's refreshing and perfect to use to sooth your skin when you need it the most. Super refreshing and a serious beauty must-have! I'm so happy with the entire BeBe and Bella BeBella line! I can't believe I hadn't heard of these products sooner; I'm just glad I finally did! It's only been a little over two weeks now of using the line, so I'll be checking back in to share how my results further improve in a few more weeks. I can't believe how much progress I've seen in such a short period of time! These are all SUCH quality products and they're definitely worth the investment. Skincare shouldn't have a price because keeping your skin healthy is so, so important. The majority of skin issues can be fixed with the BeBella line - so I highly suggest trying these out! Now I'm SO excited about this part - because I know it's going to make a lot of you so excited too! You can use code PRIMP20 at checkout to get 20% off of your order PLUS free shipping! This coupon code is super helpful in getting to try these products - I'm so excited to share it! Have you heard of probiotic skincare? I'd love to know if you use these products too! You can also check out the results of some other ladies trying these products out by following hashtag #BeBellaPrimp on Twitter and Instagram - it's always nice to get an array of reviews when trying new products! Thank you for supporting the brands that support Daily Dose of Design! While this post is sponsored, all thoughts and opinions are - as always - solely my own. I love learning about new skin care and beauty products! I'll have to check out this brand! I need something like this! It would be a great way to clean my skin and maybe moisten up my skin. My skin is so dry! I will have to check this out! What an awesome skincare regimen! I've never taken pills to help with my skin, but I've always been interested in the idea. I love the cute bag it all comes in! Adorable. I have never heard of this brand before but I enjoyed learning about it. I will definitely have to check it out! Thanks for sharing! What a great beauty regiment, I hadn't even heard of bella skincare before and love the idea of attempting to add it to my routine! This is a brand I have not heard of before. I think a sound beauty routine from the inside out is very important. I never heard of this brand but love hearing about your skincare regimen! Thanks for sharing! I have never heard of this brand, but I'm very interested to see probiotic supplements targeted for skin care as a part of this regimen! I am definitely in need of a new skincare routine. And these products look amazing. I definitely want to try them! Probiotics are so big right now. I take a daily probiotic supplement but I have never thought about probiotic skincare. I've been hearing a lot of probiotic beauty lately. Can't wait to try it. Really curious about its efficacy! This sounds like a really nice skincare line. I love products that leave my skin feeling renewed. I'm with you on loving that they're water based. I just feel better that way! They always say don't judge a book by its cover, but I am seriously loving this packaging! That alone would be enough to make me want to check out this skin care line! I've never heard of this brand and look forward to researching more about it! Thanks for sharing! I haven't heard of this brand but I think the packaging looks really chic and pretty. I also love the handy travel sizes and would be perfect on a break. It's always nice to try new products and new technology even with make ups. It looks like you have a lot of new things to try out. I have never heard of probiotic skin care before. The BeBe & Bella daul probiotic skincare system I would love to try. This is something I am going to have to check out for sure. Thanks for sharing these awesome skin care products. These all look like such great skin care products! I will definitely have to look into to trying them! I like that this system is so comprehensive, helping to create great skin from the inside, out. I've been using this system for 3 weeks now and it's amazing! I have never heard of this line before! I know as I am getting older my skin needs some extra love and care. I also have oily skin, so the fact that they're all water-based sounds fabulous to me! I am loving this skincare system! My skin has already improved in just 2 weeks! I'm curious to see if the supplements help! I really think this is one of my fave cleansers ever. I am so obsessed with this entire line. My partner has been using this brand for at least a few months now and she loves it - topped up a couple of times. You had me at collagen. I am adding this to my 'must try' list! Sounds great!! I've heard great things about this line! Definitely a line of products I need to try. What a fantastic review. Omg, the packaging is gorgeous and I want to try out that toner so badly! I am a major skincare junkie so I always love trying out new skincare products! This line sounds great so I will definitely have to check it out! I haven't heard about this brand before. I'll definitely have to do a bit more research on them. Thank you for sharing! I would love to try this line. I love a good toner so I am very interested in theirs. I've fallen so in love with that Essence Stick. It's amazing and so handy! Yes! I really believe that the probiotics really do good! This is such a great skincare line! I'm loving the toner and the essence stick so much! Nice post. Your skin is an extremely delicate part of your body, and you must make sure that you pay ample attention to it in order to keep it nourished and healthy. I loved these beauty products. Though I am following a proper skin care routine but I am not getting that much glow that I should as irtr been3 months. So, may be its the type of product that I am using. Research in to skincare helping us to fight against the signs of aging and to keep a glowing skin. Behind every beauty product lies years of scientific research and challenges. Nice products. Beautiful skin can only be achieved if you pay attention to it and work hard for it. Try to remain away from the sun as much as possible to avoid darkening of your skin as well as the appearance of dark spots all over your skin.